Studying abroad was high on Corjenay Stuart's wish list when she enrolled at Middle Georgia State University. Aside from a simple desire to see a bit more of the world, Stuart wanted to be the first of 11 children in her family to travel outside the U.S. But the traditional study abroad options, usually involving six to eight weeks during the summer at a far-flung locale, were out of the question for the San Francisco, Calif., native whose family now lives in Lawrenceville. "The cost was just something I couldn't consider," said Stuart, a 25-year-old senior majoring in Public Service. "Plus, I don't have that kind of time. I work every summer at a call center in Alpharetta to help pay for books and make sure I have spending money during the school year." So Stuart's interest was piqued when, several months ago, she learned about a weeklong service-learning trip to the Dominican Republic that Middle Georgia State's Office of International Programs is trying out for the first time in late May. Traveling by cruise ship from Miami to the coastal city of Puerto Plata, students will spend their days participating in a variety of service-learning projects and enjoying the local culture in the evenings. Stuart could manage a week away. And the cost? The $700-$800 per student price tag, which included lodging on board the Adonia and most meals and activities, sold her. "I've been saving as much money as I can so when I go the sky's the limit," she said. "I don't know when I'll get a chance like this again so I'm going to make the most of it." Stuart will be one of nearly 30 MGA students setting sail for the Dominican Republic on May 21. They are the pioneers in the University's first venture into a newer approach to study abroad called "impact travel." Middle Georgia State calls it "Knights Impact." "Fathom, the tour operator we've partnered with, defines impact travel as travel with a purpose," said Dr. Laura Thomason, MGA's director of International Programs. "Students get to choose from a slate of activities they will take part in during the trip. They'll work with local organizations on projects that have meaningful social impact." Impact activities are rich and varied. Students will help young Dominicans with their conversational English, work at a recycled paper and crafts enterprise created by local women, or help out at a cacao and chocolate cooperative. Other activities MGA students are scheduled to take part in include working at a water filter production facility that increases access to piped water for locals and participating in a reforestation and nursery project. "Through travel, our students can make a difference for good," Thomason said. "Many people long to make a difference in the world but have no idea where to begin. This program exists to connect people’s passions and gifts with the needs in the world." The students will have some free time, too, so they can indulge in activities near the ship's port of call, Amber Cove, which offers fishing, snorkeling, a water park, zipline adventures, and shopping. Knights Impact participants will qualify for "silver level" recognition on their academic transcripts and at graduation through the University's experiential learning initiative known as Knowledge@Work. Thomason and Chris Tsavatewa, director of the Office of Experiential Learning, worked together to develop the Knights Impact program. "We're excited for this first group of students who get to experience Knights Impact," Tsavatewa said. "They are going to be our biggest recruiters and ambassadors as we try to expand similar opportunities to other Middle Georgia State students who might mistakenly believe that an international experience is not a realistic goal for them." MGA students taking the first trip are divided into three cohorts, each assigned to a faculty or staff member serving as a program director. Thomason is one of the program directors; the others are Keigan Evans, assistant director of Residence Life, and Dr. John Girard, professor of Information Technology. The 30 students are mostly of traditional college age but some, such as Stuart, are a bit older with work or family responsibilities. 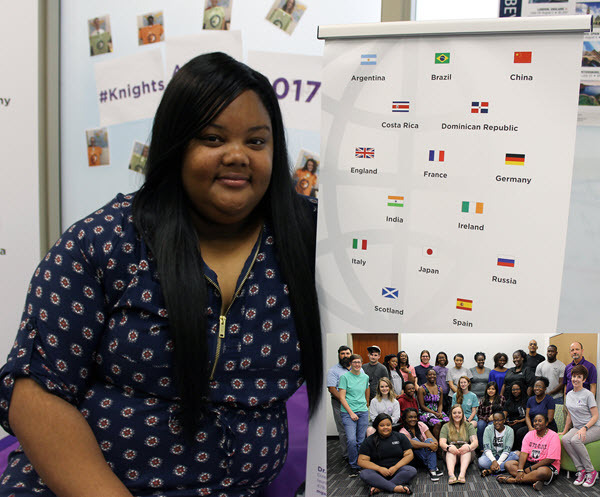 That's why Thomason wanted to add shorter, less costly trips like Knights Impact to MGA's international program mix. "This is ideal for those students," she said. As for Stuart's multiple siblings, they are more proud than jealous to see their sister realize a dream. They cheered when Stuart told them her passport had arrived in the mail. "I'm wearing that passport like an honor badge," she said. Photo: Corjenay Stuart and, in the inset, her fellow MGA international experience travelers.